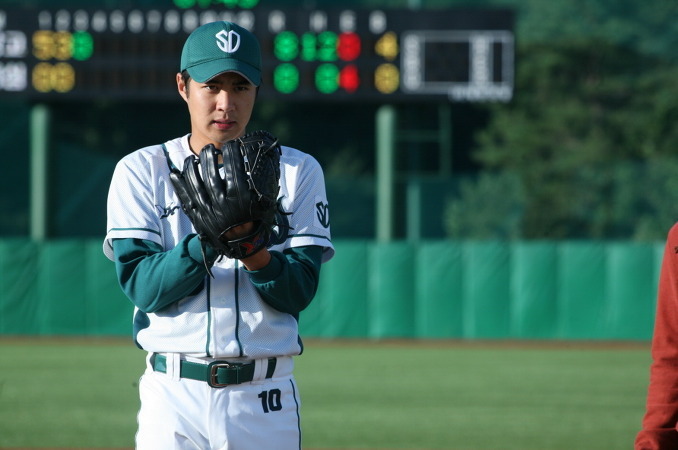 "G-Love" centers around a has-been professioanl baseball player (Jung Jae-Young), a female school teacher (played by Yu-seon), and a group of deaf high school baseball players. Friendship & love are explored in the film, set within a countryside backdrop. 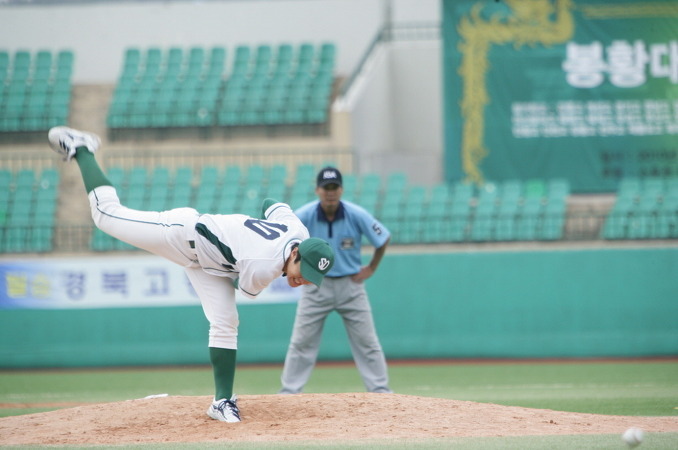 Fading star baseball player Sang-Nam (Jung Jae-Young) finds his name more in the media these days for his boorish behavior. The latest of which involves Sang-Nam involved in a drunken brawl and swinging a baseball bat. His agent Charles (Jo Jin-Ung) then advises Sang-Nam to take a job coaching a team of hearing-impaired players at a rural school to help rebuild his image. Sang-Nam arrives at the school with the boys welcoming him with open arms, but Sang-Nam is less than enthusiastic about his new gig. The boys have never won a game, there's only 10 players (with 1 available pitcher) and Sang-Nam is clueless on how to coach a team who can't hear. There's also Ms. Na (Yoo-Sun) who works as the music teacher and baseball manager. She's ultra protective of the boys and chastises Sang-Nam for his condescending attitude. Sang-Nam already wondering when he can go back to the pro league is counting his days until he can go back to the LG Twins. Then something happens. Sang-Nam and the kids start to form a genuine bond. Soon enough, Sang-Nam finds himself energized by the kids purity and starts to put out sincere effort in preparing the team for the nationals. "GLove" is based on the true story of the Chungju Sung-Shim baseball team, located in Chungju City, North Chungcheong Province. The school's baseball team started in September 2002 and consisted of 25 players who were deaf. Filming started June, 2010 & finished November 10, 2010. Last scene shot took place in Muju County, North Jeolla Province. Eric Lundgren Aug 17 2014 9:17 pm I'm deaf and live in USA. How can I buy DVD for the "Glove" ? Alvina Sep 25 2011 4:52 pm The movie was an all around, feel good sports movie (the cliches and all). It actually reminds me of a trend that sports movies world wide seem to be taking (see Indian movie: Golkonda High School). Jung Jae-Young, Jang Ki Bum (a young Kim Min Jong anyone? Those eyes), Jo Jin Ung, and Kim Hye-sung (who is always making the best of these second lead roles. I'm waiting for his breakout role; perhaps after army comeback?). Lily Mountjoy Sep 03 2011 3:31 pm Hi, I dont know about this movie but seem must be good!! I am going to facebook to let them know about it! COOL!! Proud of it! James Markel Jr May 13 2011 5:21 pm awesome movie im looking forward to watch this movie soon. SoFF-OnE Jan 26 2011 12:32 am Oh..man..just watching trailer make my eyes teary.Heard its a big box office in Korea.Looking forward to this. Ki Jan 25 2011 9:40 am "GLove" is a double-edge sword of good and bad things. On the positive side you have the main performers (Jung Jae-Young, Yoo-Sun, and the baseball team) who are all likable. There's also the root for the underdog factor that will have you cheering for the baseball team. The negative of the movie is the constant insistance on applying a "puppetmaster" like effect on the viewers. You know, que the violins, have someone swell up tears, and have the audience drop a whole lot of tears. This worked a few times, but it also got grating. Director Kang Woo-Suk could have definitely toned downed this aspect of the movie. I also thought thought it was cheesy showing the "Love" aspect of the word "Glove" in the movie, but that's more personal preference. What I did like about the movie, the baseball play, Jung Jae-Young coming around to coaching the team, and Yoo-Sun's motherly approach on the boys vs. Jung Jae-Young's drill sergeant approach all made the movie watchable and intriguing. I did even swell up with tears at a few scenes and rooted for the team during the tournament. If only the movie toned down the sappiness this movie would have been great, but instead we have a pretty good film. That's not a bad thing in the grand scheme of things I guess.